Or more accurately, a wretch, three queens, and a king, as Dan looks at thrones and groans from Episode 5 of Game Changers, "Dirty Deed." Plus idols galore, and a look ahead at the swap. It was the worst of times, it was the worst of times. But it didn't need to be. Jeff Pitman's lengthy dissection of all that's wrong with the two tribes, one vote twist. Dan examines the conflict between prior game reputation and twists that require snap decisions, as in the Malcolm-booting Tribal Council in this week's episode of Game Changers. Then he takes a look at rising and falling players. Jeff takes a look at the Goat Rehabilitation Program evident in Episode 3 of Game Changers, including actual goats, and also some older male returning Survivor players. Ben examines the changed games evident in mellow Troyzan, social Brad, and various people searching for goats, as seen in Episode 3 of Survivor: Game Changers. 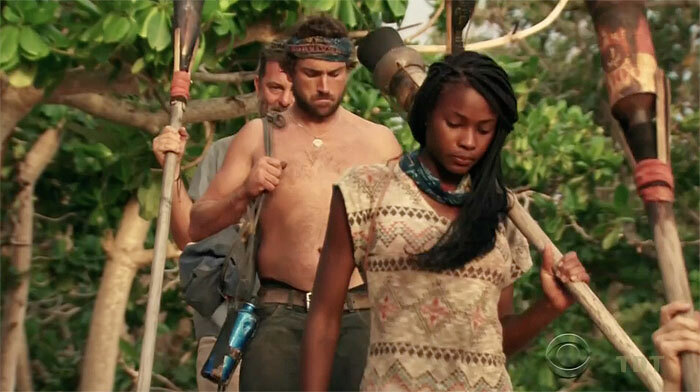 Jeff looks at the two booted players from the premiere double episode of Survivor: Game Changers, and asks to what extent returning players can counteract their made-for-TV reputations.